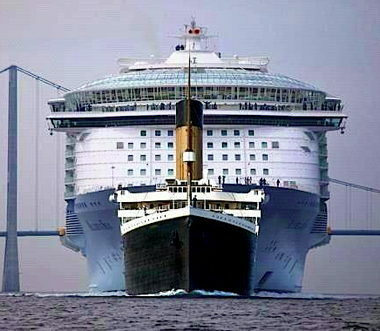 We all think of the Titanic as a big ocean liner well at least I did until I saw this comparison: Titanic vs Allure of the Seas. Posted by gerardvanderleun at March 19, 2013 11:54 AM. This is an entry on the sideblog of American Digest: Check it out. Good Jesus. If that beast didn't actually exist, Bruce McCall would have had to draw it for the New Yorker.